Birch Point State Park affords the visitors majestic views of Penobscot Bay and the islands that lay past Mussel Ridge Channel. You can enjoy fishing or picnicking while taking in the view, or during gentle surf conditions, take a quick swim in the Atlantic Ocean. The Park has a wonderful sandy beach, which is very inviting. Be cautious however, when swimming as there are no lifeguards on duty. Birch Point State Park is a day use only area, but it offers fantastic ocean side enjoyment. 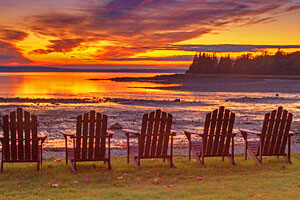 Enjoy scenic views of Penobscot Bay while you picnic, fish or swim. Due to the abundance of wildlife and the many scenic views, photography is also a favorite pastime. Generally open from Memorial Day Weekend through Labor Day Weekend, the Park enjoys average summer temperatures over 68 degrees.